Eight years ago, Gregory Jobson-Larkin gave up his job in communications to be a stay-at-home dad. While the New Yorker loves the role, he's blunt about how he thinks some view him and his fellow full-time fathers. "We're lazy, slovenly individuals that sit around in the cave all day and the kids just sort of poop in their pants and do their own thing," said Jobson-Larkin, who previously spent a decade serving in the Navy. "The misconception is that we can't do as good as a job as the women can." But Jobson-Larkin - and a mounting body of research - say not only are at-home fathers doing the job, they're thriving. The ranks of at-home dads are on the rise, more than doubling over the past decade. Last year, the U.S. Census said there were 189,000 at-home fathers but that tally does not include men who work part-time or night shifts. The actual number of stay-at-home fathers could be as high as 1.4 million, according to one researcher. A 2012 study from Boston College's Center for Work and Family, which included interviews with at-home fathers and surveys with their spouses, found that full-time dads are finding fulfillment in their new roles. It also knocked down two lingering stereotypes about these men: First, they actively choose this lifestyle and are not simply victims of the recession and second, they are hardly inept. "We definitely discovered they make good fathers, they make good parents," said one of the study's authors Fred Van Deusen, who added that at-home dads "fulfill a lot of roles a stay-at-home mom would do," like preparing food, doing the laundry and taking the kids to the playground. But even in 2013, the simple act of a father walking solo with his kids down the street can raise eyebrows. At-home dads say that passersby often assume they are giving the mom a break for the day or they must be overwhelmed. Or both. "The statement I hear three or four times a week is 'whoa it looks like you have your hands full there!'" says chef-turned-primary caregiver Joe McLaughlin. "I feel pretty confident doing what I'm doing." Tim Mulvaney used to run his own consulting firm. Now the full-time father of two says when his kids are happily frolicking with him in the playground, casual onlookers act like "a miracle has occurred, that the angels have sung ... it's like 'How can this guy be out and still taking care of kids?'" But while Mulvaney, McLaughlin and Jobson-Larkin are generally comfortable in their roles as primary caregiver, they still struggle with a feeling of disconnect and isolation. That common bond is one reason they all joined NYC Dads Group, a support network for fathers in the New York City area. The group connects dads and their kids through meet-ups, screenings, gym classes, museum trips and social events. You can even sign up for a "new dad boot camp," which lets expectant dads learn diaper wisdom from the "veterans" who have recently been through child birth. Founded five years ago by stay-at-home dads Lance Somerfeld and Matt Schneider, the network now claims almost 800 members. Schneider admits that many fathers are initially wary of joining a men's group, but he says once they show up, they're usually hooked. "Once they come to meet up and see we're not sitting around talking about our feelings and singing 'Kumbaya,' we're just hanging out in the park, we're playing music together or playing sports, they're much more likely to come back," Schneider said. "We serve as a support for these dads but it's not in your face." A recent Pew study shows that far more working fathers (46 percent) than working mothers (23 percent) say they aren't spending enough time with their kids. While Schneider and other at-home fathers admit they had a tough time leaving the workforce, many were eager to make the transition. "It's not just about being a paycheck anymore. You're also measured by how much time you're able to spend with your kids and how much you're able to do with your family," he said. "Dads are not coming home kicking back with a scotch and a newspaper, watching a partner cook and clean and handle all the stuff related to school." Like most of the dads we spoke to, Schneider says he had a solid relationship with his own father while growing up. But he says his dad was "a product of his generation" - always focused on work, and often away from home. Schneider suspects that his father has some regrets about what he missed and is now a little jealous of his son's lifestyle. Eight years ago, Schneider was a public school teacher in the Bronx. 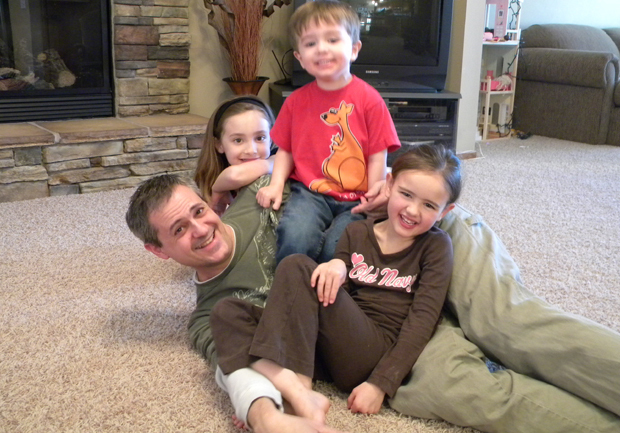 Today the at-home dad has arguably a more hectic schedule. He divides his time shuttling his two sons, Max and Sam, to and from school, doing housework, cooking all of the meals, helping with homework, running the NYC Dads Group, and serving as PTA president at his kid's school. Schneider says that many at-home fathers struggle with establishing an identity so it's important not to confine yourself to one role. Case in point: Chris Routly, a graphic artist and illustrator who lives in Portland, Oregon. Routly gave up his full-time design job four years ago to be an at-home dad, but he's hardly given up on pursuing his hobbies. He's even become what he calls an "accidental activist." Routly now illustrates children's books and writes regularly about fatherhood on his blog. Last year, he made headlines for publicly taking on one of the titans of baby merchandise: Huggies. Routly was so offended by the diaper company's ads depicting dads as inept buffoons that he spearheaded a campaign to protest the commercials. Huggies pulled the ads. "People using their products are dads too," Routly said. "My hope is that a lot of companies were paying attention, a lot of people said 'we don't want to make that mistake.'" Al Watts, a full-time father of four who is president of the National At-Home Dads Network, thinks efforts like Routly's are chipping away at misconceptions about fathers. "There's a big perception out there that dads are going to fail, that dads can't cook, that they don't even know how to turn on the microwave, or put on a diaper," said Watts, who lives in Omaha. "Today's fathers are not that way. Advertisers are finally picking up on that - they buy groceries and they cook and they can put on diapers and they buy tampons for their daughters. These are things that have changed in this country." But some perceptions have apparently not changed. According to a recent Pew survey, a small majority of Americans are still not comfortable with the notion of a stay-at-home father: 51 percent of respondents said that children are better off if a mother is home and doesn't hold a job; just 8 percent said the same about a dad. Van Deusen, who co-authored the Boston College study, says that's a societal perception. But he says the spouses of at-home dads he surveyed unanimously praised their husbands' performances as full-time fathers and appreciated that their careers were benefiting as a result. But boys will be boys. Van Deusen says that while the spouses thought their stay-at-home husbands excelled at being the primary caregiver, they had reservations about their role a primary housekeeper. "I don't think they've lost their gender identity," he said. "The moms still complained about the housecleaning."